When planning meetings and events, it is our job to step out of our own preferences and think about the perspectives of all attendees. This can be challenging as the majority of event planners fall into the same demographic and it can make seeing different perspectives even more difficult when most of your peers see the world through a similar lens. Meeting professionals have a real opportunity to bring diversity and inclusion to life, which is a strategic priority for most Canadian organizations. Now let’s consider alcohol. Let me start by saying that I LOVE wine, and am more than happy to attend events which include alcohol. Alcohol is such a big part of our society that we don’t think twice about including it into our events. There are two types of events where alcohol is served: one is a reception/meal where alcohol is served but is not the focus. The second is where the experience, theme or team building activity is centered on alcohol and it plays a starring role (ie. wine/beer/whiskey tasting activities or mixology/cocktail making experiences). These are the events that need a rethink! Put yourself in the position of these people who might be attending your event and try to see the experience through their eyes. Imagine arriving at a venue for an event and being offered a drink and hearing the plan for the evening: You will be broken into teams to watch demonstrations on how to make cocktails and learn to make them yourself. 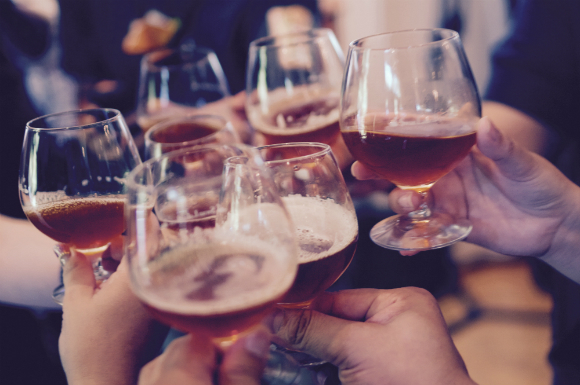 Think about how stressful it would feel if you were a recovering alcoholic out with a group of colleagues? Now you would need to come up with excuses for why you can’t take part and fear being found out. What if you are pregnant and haven’t told anyone yet? What if you don’t drink due to your religious beliefs? Even if you act like a team player and take part, networking can get uncomfortable because people keep asking why you aren’t drinking. Now everyone is just talking about the different cocktails they are tasting and you feel left out, there is nothing else to do and you can’t just leave. You likely feel very awkward while others are having fun shaking cocktails and possibly drinking too much. Before any wineries call me to object (and I do love wineries), I am not saying alcohol-focused team-building activities should never be a part of our events! They are great for the right group. Just like we wouldn’t take every group zip lining, we need to get to know individual preferences before deciding that something like mixology or a wine tasting tour would be appropriate. How to know for sure? I suggest doing a survey in advance and being prepared for the results. If one person has a real concern about the activity, you might want to adjust your plans. Maybe you can still hold that event but plan for different preferences. In the end, it comes down to being considerate and inclusive of all guests, not just the majority. Never make assumptions on what people will like, especially when it comes to alcohol. Ask questions, of yourself and of your group! This entry was posted in Event Operations, Food & Beverage and tagged alcohol, Andrea Boulden, diversity, inclusive, team-building events.